Richard Dawkins discusses in his book “The Selfish Gene” if we are using our genes to propagate ourselves, or if maybe our genes are using us to propagate themselves. According to Dawkins life may very well have begun a long time ago, in the primordial soup, when simple clumps of amino-acids became self-replicating. This self-replication started a kind of war between competing replicators and who was on top (or in the majority) in the soup probably changed many times until one kind of replicators using a protective layer of matter came out the winner (one cell organisms). 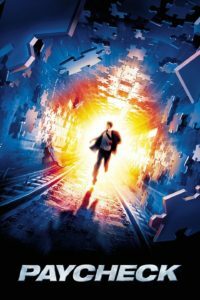 Paycheck (IMDB, Amazon) is a story about Michael Jennings (Ben Affleck) who is an engineer, or to be more precise a reverse engineer. Michael is paid to take competitor’s work and reverse engineer it into something his employees can make into a products of their own. Since it would be very bad if information about whose technology was reverse engineered into what, Michael’s assistant Shorty (Paul Giamatti) helps removing all of Michael’s memories of the project once work is finished. A once in a lifetime opportunity comes along as Michael’s old friend Rethrick (Aaron Eckhart) offers him work that will give him stocks in Rethrick’s promised-to-become-great company. Michael takes on the three year project, even if he risks losing his memory for the whole period, and that of a probably blooming romance with one of Rethrick’s employees, doctor in biochemistry, Rachel Porter (Uma Thurman). Three years passes, Michael finds himself back where he once begun, in Rethrick’s office, his memory wiped and all that stands between him and his millions, a trip to the bank. That is however, when problem starts, because Michael finds not only has he switched the personal effects he once had to leave before entering Rethrick’s employee, he has also forfeited a 100 million dollars worth of stocks in Rethrick’s company. I entered the room and guess if I was surprised. My neighbor gasped with my astonishment, and as he had one of my thoughts, he came over to my own apartment to have a talk with me. He told me, with his wife’s voice, he disliked all but his own ideas. I had one of his ideas and in a contrary to his position, decided I liked it, so I made it my own idea. It could get pretty interesting after a while of that. Perhaps the next pop-style of writing…? Ultraviolet (IMDB, Amazon) is a story about Violet, an ordinary woman whose life changed when she was infected by a virus that turned her into a feared and hated hemophage. Once contracting hemophagia, Violet was incarcerated and experimented on, and perhaps these experiments cost her the child she was bearing when infected, perhaps the infection itself did, regardless, Violet escaped and now she is out to steal the government’s latest and most deadly weapon in the fight against hemophages. The hemophages have superhuman strength and speed, but at a cost; few live longer than a decade. Since the virus that causes hemophagism infect on blood contact, the number of hemophages should have grown had it not been for the government’s prosecution. Like vampires the hemophages have pointy eyeteeth, but unlike the vampires they do not require sucking blood and taking lives to survive. They are far from demons, and rather unfortunates infected by a deadly and infectious disease, and the only demon thing about them is the demonizing of them done by the government.